After pollution was found at the Hamden Middle School and some other properties in the surrounding neighborhood, the Commissioner of the Connecticut Department of Environmental Protection (DEP) identified four parties responsible for cleaning up the site. 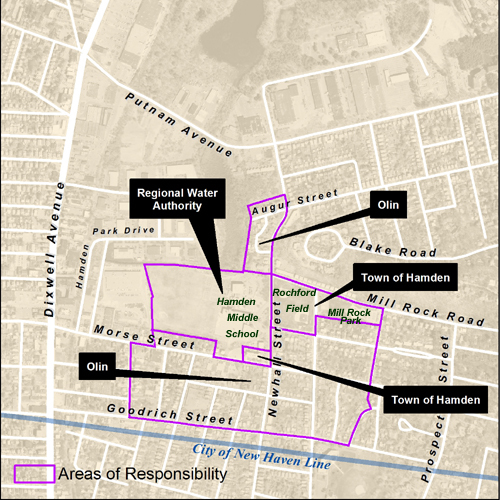 The four responsible parties are the Town of Hamden, the South Central Connecticut Regional Water Authority, the Connecticut State Board of Education, and the Olin Corporation. In July 2001, the Commissioner of DEP ordered the four responsible parties to identify the location of pollution and to remove and/or contain it. In April 2003, the four parties agreed to a legal settlement known as a consent order. The consent order outlines the duties of each responsible party in cleaning up the pollution in the Newhall neighborhood. This was an important step because it allowed the clean-up actions to start at the public school and park properties as well as the residential properties where people live. In the following summary, we explain what a consent order is, the history of the Newhall pollution, what the clean-up requirements are, and how the public can keep track of what’s being done for the polluted properties. A consent order is a legal agreement signed by agencies, individuals, businesses, and/or other parties associated with a polluted property. The consent order establishes facts about the pollution and requirements for corrective actions. Consent orders are a way to prevent costly, time-consuming lawsuits but carry the same legal weight as a court order issued after a trial. Because the parties have already agreed on the actions in the consent order, there is usually no delay in starting the work needed to resolve the problem. What properties in the Newhall area are covered by the consent order? private properties in the neighborhood where wetlands formerly existed or where dumping occurred. How did the Newhall site get polluted? Until the late 1900s, it was a common practice in Connecticut to fill or drain wetlands and low-lying areas. These areas were thought to be little more than mosquito breeding spots. Public health officials encouraged the filling of wetlands and low-lying land to protect public health. In many parts of the state, garbage and industrial waste from populated urban centers needed to be dumped somewhere. Creating dumps in wetlands seemed like the perfect solution. Large portions of the Newhall site contained wetlands and low-lying areas that were used by the public for dumping. Today we know that the waste included metals and chemicals that polluted the soil and groundwater. Although the owners of the polluted properties have changed since the dumping began, it is now the responsibility of the Town of Hamden, the Water Authority, the State Board and Olin Corporation to clean up the pollution. What does the consent order require? Town of Hamden: The Town has agreed to clean up Mill Rock Park, the portion of the Hamden Community Center (former Newhall Street School) not owned by the Regional Water Authority, and the sewage pump station. The Town has also agreed to pay for this work. The Town and the DEP will seek state funds together to investigate and clean up Rochford Field. South Central Connecticut Regional Water Authority: The Regional Water Authority has agreed to clean up the Hamden Middle School property, the portion of the Hamden Community Center (former Newhall Street School) that it owned, 249-251 Morse Street, and 253-255 Morse Street. State Board of Education: The responsibility of the State Board of Education is to pay for half the cost of clean-up on the residential properties. As noted by the consent order, this responsibility will be carried out by the DEP. Olin Corporation: Olin Corporation has agreed to clean up the “non-public” properties, meaning the land that the residential homes sit on. Olin and the DEP will share the cost of this clean-up equally. If the DEP Commissioner finds any report unsatisfactory, the responsible party will be asked to do more study. The Town, the Regional Water Authority, and Olin Corporation must monitor the work done on their behalf to make sure the clean-up is effective. However, the clean-up work must be approved by the DEP Commissioner. Any representative of the DEP may enter the public properties on the site without notice, in order to monitor and enforce the consent order. For the non-public properties, best efforts will be used to get permission for access. If these efforts are not successful, the DEP Commissioner has the right to order access. The three parties doing the work (the Town of Hamden, the Regional Water Authority, and Olin Corporation) will be fined if they fail to live up to the agreement in the consent order. The Town, the Regional Water Authority, and Olin Corporation must submit quarterly progress reports to the DEP. These quarterly reports (March, June, September and December) describe the work they have done and allow DEP to make sure they are doing what is required by the consent order. How will the public know what’s being done? The consent order requires DEP to have a plan for public participation in the ongoing site studies and clean-up. The two main purposes of the public participation plan are to allow the public to stay informed and to allow the public to comment on what the DEP, the Town, the Regional Water Authority and Olin are doing at each key step.